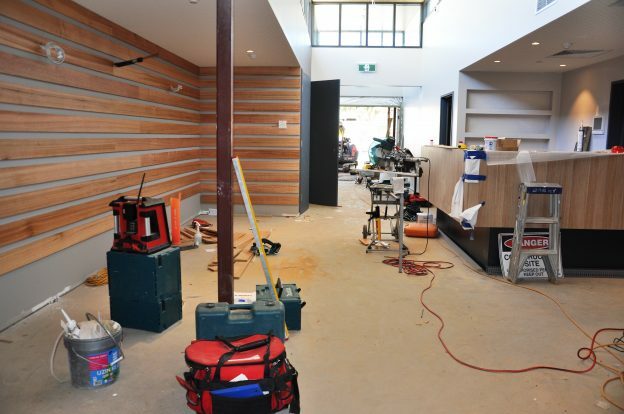 Stage 2 of the new Waranga Health facility at Rushworth is almost complete, with plastering, painting, joinery and vinyl flooring being finished off as the space takes shape. Within the next couple of weeks, this area of the facility which includes the acute beds, palliative care room, front reception, consulting rooms and District Nursing/Community Health offices and staff room will be complete and ready for use. Work on the front driveway is also now underway, including outside cladding and canopy installation along the front walkway and a concrete ramp has now been installed into Lambden House. While the extreme hot weather has created a few delays, it won’t be long until this area is all complete and the builder and contractors move onto Stage 3 works. New models of care are currently being developed to ensure that all the staff can hit the ground running in the new spaces, offering the best level of service to all patients and residents. This entry was posted in Uncategorized on February 13, 2019 by Jodie Fleming.